This set is designed to explain the importance of the practice of expository preaching and to demonstrate the craft as a pattern for preachers to consider. Our desire is to promote the preaching of the Words of the Bible, such that the preacher has placed himself under the authority of those Words. We pray that, in doing so, the people of God would be satisfied with Scripture alone for life and practice. 1. Instruction on the Biblical foundations of expository preaching. 2. Demonstration of the craft. 3. 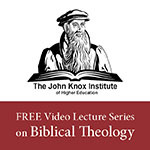 Examination of various types of texts to help you develop expository sermons.